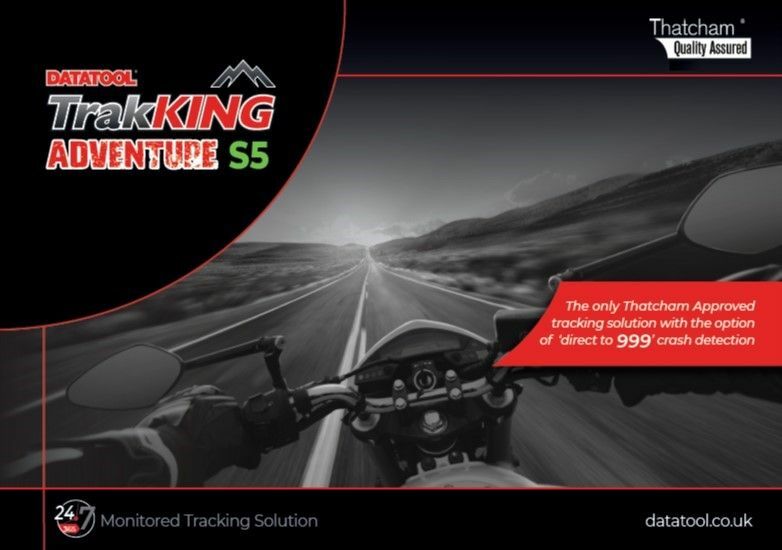 Datatool TrakKING Adventure S5 is the most user friendly and accurate motorcycle tracking system available today, using the latest satellite technology and a multi network roaming SIM, ensuring the widest possible coverage across Europe. 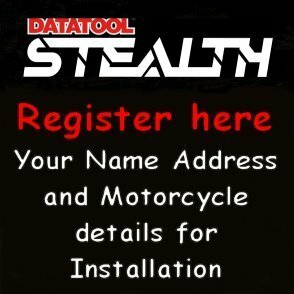 Datatool TrakKING Adventure S5 is supplied with Rider ID tags that deliver a significant security enhancement from the original TrakKING Adventure product. As soon as the ignition is switched off, TrakKING Adventure S5 creates an invisible geo-fence around your bike and starts monitoring for signs of unauthorised movement. If the unit detects movement within the geo-fence the (optional) early warning movement text will be triggered, informing you of a potential theft event. If your bike is subsequently removed from the geo-fenced area without the Rider ID tags present, TrakKING Adventure S5 will enter alert mode, notifying our 24/7/365 monitoring centre, who will in turn contact you immediately to verify the cause of the alert. If you confirm your bike is stolen, the monitoring team will liaise with the police to aid recovery. Datatool TrakKING Adventure S5 offers full journey history logging and the ability to create location or event based alerts. In normal use, TrakKING Adventure will record the vehicle position every 15 seconds and upload that data to the cloud every 2 minutes, giving you a permanent record of every journey. TrakKING Adventure is a true pan European product, with coverage available in all of Western Europe and many countries beyond. Routes can be downloaded and shared with friends and points of interest can be recorded for future reference. In addition to the tracking capabilities, TrakKING also monitors the vehicle battery and will notify the owner of a low battery condition before the battery becomes completely discharged. If the battery is disconnected an alert will be sent to the monitoring team. With 24/7 monitoring and dedicated staff, TrakKING Adventure really does deliver peace of mind. (Impact detection and alert): TrakKING Adventure contains a highly sensitive 3D accelerometer which can detect the difference between a fall in a car park and a high speed impact. SMS notifications can be sent to emergency contacts in the event of a high G impact. Customers can enable or disable G Sense from the user control panel. In addition to G Sense impact detection and alert, every smartphone owning TrakKING Adventure customer is offered the optional upgrade of direct to 999 alert. TrakKING Adventure provides the capability to send an alert based on the vehicle arriving or leaving a specified area. E.g. a reminder to pay a toll. At the first sign of movement, you have the option of receiving an SMS text alert. 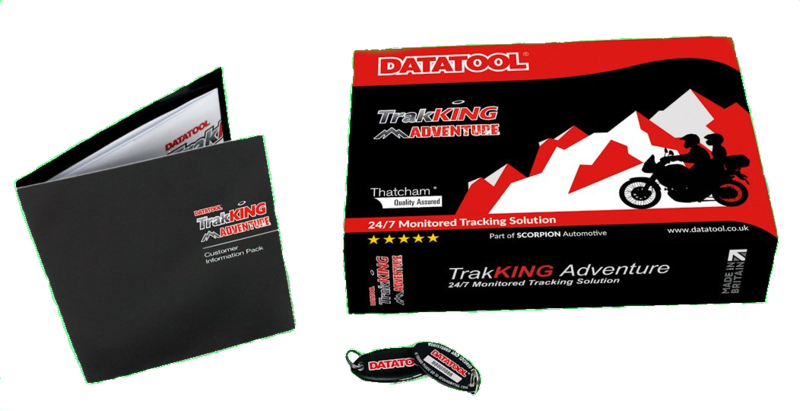 Datatool TrakKING Adventure delivers the same security peace of mind as the original TrakKING but with a range of additional features including full journey history logging and the ability to create location or event based alerts. ‘G Sense’ Notifications: (Impact detection and alert) TrakKING Adventure contains a highly sensitive 3D accelerometer which can detect the difference between a fall in a car park and a high speed impact. SMS notifications can be sent to emergency contacts in the event of a high G impact. Customers can enable or disable ‘G Sense’ from the user control panel.